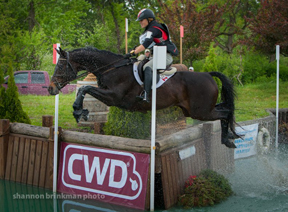 Canadian 2012 Olympic duo, Jessica Phoenix and Exponential rode to a spectacular victory in the CCI 3* division at the Jersey Fresh Three Day Event held in Allentown, New Jersey, USA, May 8 – 12, 2013. After earning a score of 52.7 in the dressage test, Phoenix, of Cannington, ON, and Exponential, her 15-year-old Canadian Thoroughbred gelding, started the cross country day in fourth place. The pair quickly moved up the leaderboard into second after being one of only two double clear trips over the extremely tricky course designed by 2011 Pan Am Games Eventing course designer, John Williams. On the final day of competition, Phoenix and Exponential headed into the show jumping round with just 1.2 penalties separating them from first place. As the second last pair to compete in the CCI3* division they pulled one unlucky rail giving them four faults with one rider left to go, frontrunner American Buck Davidson on D.A. Admiro, who took down two rails for 8 faults giving Phoenix the win on a final score of 56.7. Phoenix also rode Erodium, Kirk Hoppner’s 12-year-old Dutch Warmblood gelding sired by Emillion, in the CCI3* division. The pair scored 55.4 for sixth place in their dressage test, went clear the next day over cross-country but took on time faults leaving them in seventh. The pair finished on a final score of 86.2 after experiencing 16 faults in their show jumping round finishing eighth overall. In the CIC 3* division, Rachel McDonough of Etobicoke, ON, and Irish Rhythm, her 14-year-old Canadian Thoroughbred sired by Vice Chancellor, scored 69.2 in Dressage, went clear over cross-country course but took 4.8 time faults. In show jumping, the pair took two rails and incurred eight time penalties finishing on a final score of 90.0 taking eighth place. In the CIC2* division, Jordan McDonald, of Oakville, ON, rode Prince Mayo, Amanda and Jorge Bernhard’s 8-year-old Irish Sport Horse gelding sired by Bonnie Prince, to a seventh place finish on a final score of 66.7 and Tik Maynard, riding out of Branchburg, NJ, USA, took 11th place aboard Sapphire, Richard Maynard’s 14-year-old Dutch Warmblood mare sired by Marlon, with a final score of 72.7.